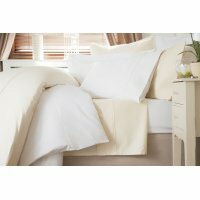 Our 600 Thread Count 100% Cotton Sateen Range is available in pure white and ivory, feels wonderfully smooth and soft to touch. The high thread count sateen weave gives this fabric both a lovely drape and fine luster. Stitched with smart pin tuck details this is undoubtedly a truly luxurious range of linens that will give years of pleasure. Also available in Emperor bed size. Our 600 Thread Count 100% Cotton Sateen Range is available in pure white and ivory, feels wonderfull..
Our 1200 Thread Count 100% Cotton Range is available in pure white and ivory, feels wonderfully smoo..
Our premium blend 500 Thread Count Rich Sateen Range is available in pure white, ivory or platinum g..